First post so apologies if this is not the right place or format. REQUEST: I think the Web Clipper would be improved by letting users create Notebooks from the Web Clipper drop down. I've started a new night course on UX and so am finding tonnes of websites, notes etc. So I created a UX notebook but this can also expand into IA Information Architecture so need new notebook or sub topic like UX/Sketching so need sub note book or my UX one. I keep having to go out and create the notebook in another tab then go back and clip the page again for new notebook to appear. I'm using Evernote Web Clipper on Chrome on Mac OS 10.9.4. Great product... love the new beta. We really must have the ability too add a new notebook with the browser extension. Yes, it would be really nice to be able to create new notebooks from web clipper on the fly as well as deeper nested notebooks. In this way, I wouldn't have to spend additional time to go back to the application to sort the notes. clip mode. i can add the info. to an exiting notenook, but not to add a new one.'. I totally agree. OneNote Clipper is not as wonderful as Evernote Web Clipper but it has add a notebook option. Sometimes when you are browsing you come across some topics you feel you need to put in a new notebook. Yo do not want to go in to Evernote to do that. Instead I add everything to my general username's notebook and when i have the time place them into different new notebooks. I agree. On my Android devices, I am able to create a new Notebook as needed when I clip something. On my PC, I need to go into EverNote to create the new Notebook - or just save notes into a To-Be-Sorted notebook and sort later - exactly what I have been trying to avoid by switching over to EverNote. Yes! I'm having to jump back to my home screen in iOS, launch the app, create a new notebook, then return to Safari. At least, create a link to jump to the app in the clipper dialog. This is a great suggestion. 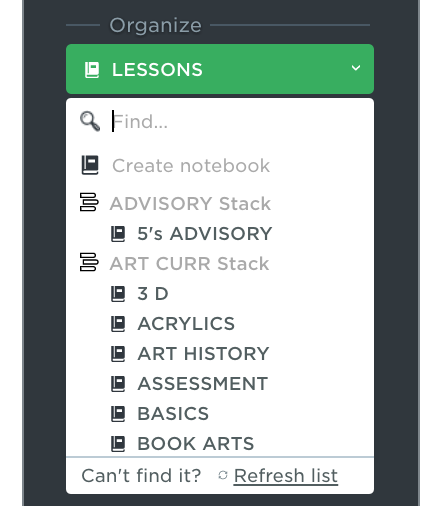 I encourage everyone to up-vote on this in the top left corner of this screen if you would like to see something like this to be integrated into the Evernote Web Clipper. I just came across this conversation because I thought I used to have that option and I could no longer find it. I found no solution online. I deleted com.evernote.EvernoteHelper.plist from the Mac Library, deleted the Web Clipper extension and reinstalled it. I now have the option restored. I am Mac El Capitan and Vivaldi browser.